Two training weekends were held in December and January as part of the Every Barn (Cow’us) Tells a Story project. The course provided the attendees with an introduction to field barn surveying techniques, including digital photogrammetry. Field barns are an important feature in the Yorkshire Dales, and are one of the special qualities of the National Park. The aesthetic and historical value of the field barns within the landscape of Swaledale and Arkengarthdale has been recognised as nationally important due to its designation as a Barns and Walls Conservation Area (the largest conservation area in the country). Due to the modernisation of farming techniques and the resulting changes in agricultural practices, many of these field barns are becoming obsolete. Barns that are not being used can easily start to deteriorate. As a result barns are becoming ruinous, while others are lost due to conversion for domestic or holiday use. 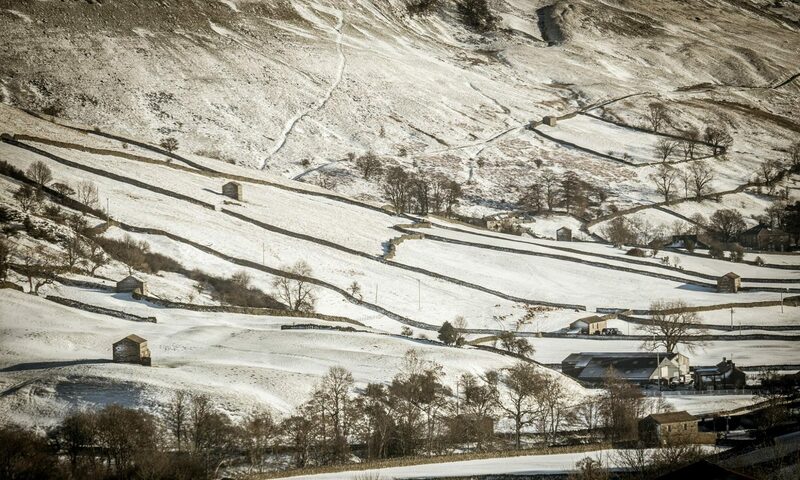 This loss of such a distinctive landscape feature in Swaledale and across the whole of the National Park makes it incredibly important to survey and enhance our knowledge of these barns. Surveying can help uncover the story of the barn, as well as giving crucial updated information on its condition. However, if this is to be achieved volunteers are essential. The first weekend was an introduction to the field barns that could be found in Swaledale, this included the volunteers learning lots of new terminology for the multitude of external and internal features. They were also given an introduction to surveying methodology and were able to practice all the new techniques learnt over the two days in small groups. The second weekend offered an introduction to photogrammetry. Photogrammetry is where you use digital photographs to make a 3D digital model of the object on a computer. These models are a great visual resource, and can be incredibly useful for surveying. (Examples of models can be seen here.) The last day was an overview and allowed the attendees to focus on what they most wanted to, whether it was survey forms, terminology, photogrammetry etc. “A very interesting and engaging four days. Enthusiastic and knowledgeable presenters. Learnt a lot”. The Every Barn Tells a Story project is coming to an end, but through weekends like this a better understanding of field barns is promoted and skills are transferred in how to survey them, which is all part of the project’s legacy.